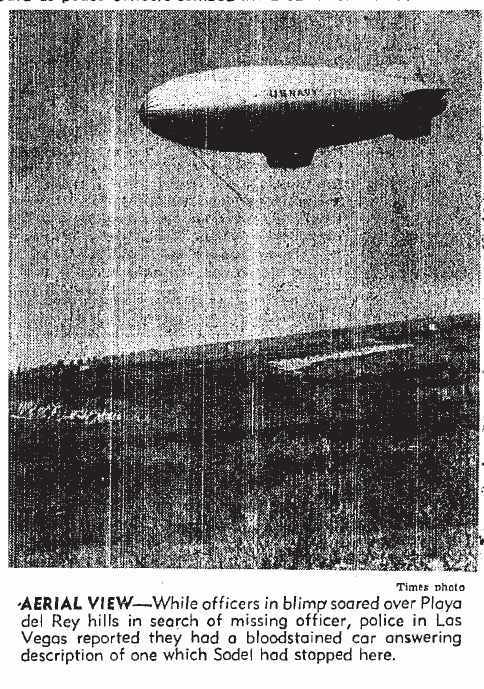 Equipped with binoculars, the observers aboard a Navy blimp piloted by Lt. A. J. Slack skimmed the treetops of Palos Verdes, Playa del Rey, Hollywood Hills and Topanga Canyon searching for any sign of missing CHP Patrolman Steve Sodel. The terrain yielded nothing. Detectives attempted to piece together a plausible scenario for Sodel’s disappearance from the scant clues available. 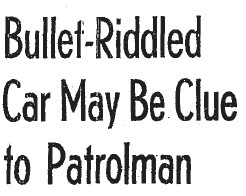 They believed that the officer had the misfortune to meet up with one or more so-called “cop-haters” who then forced him at gunpoint into the Chevy sedan. Tire impressions found at the scene showed that the sedan had backed up and then “dug out” past the parked CHP prowl car. 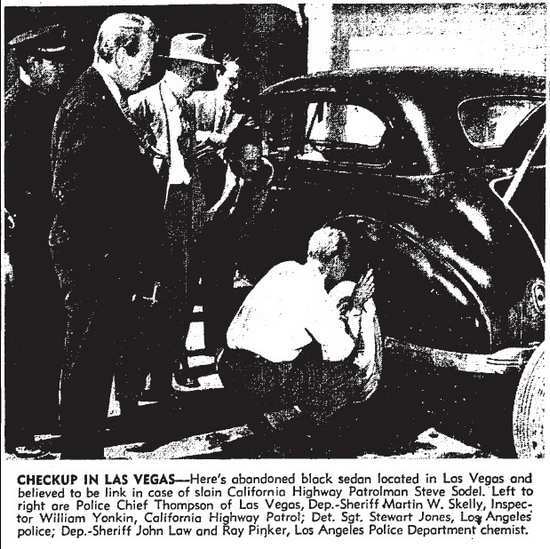 Late on the fourth day of the search a bloodstained sedan, riddled with bullet holes, was found abandoned near Las Vegas, Nevada. A private plane owned by a member of the Los Angeles County Sheriff’s Aero Bureau flew members of the CHP and the Sheriff’s department to the scene. The search of LA’s environs was a bust, but the car in Las Vegas was a treasure trove of useful information. The car was sitting in a Las Vegas police impound yard when LA detectives and criminalists arrived to examine every inch of it. The car was stolen, just as they had thought. There was a bullet hole in the trunk and something that may have been blood was discovered on the front fender. Tests were needed to determine whether the stains were human and not animal blood. The vehicle was dusted for prints inside and out. Paperwork, routinely carried by highway patrolmen, was also found in the car. The evidence was flown back to LA and they got a hit on the fingerprints—they belonged to Albert A. (Tony) Adams, a house painter in his mid to late 20s. They also traced the owner of the stolen car. It belonged to Jeanne Trude, 10540 Cushdon Avenue, West Los Angeles, and was stolen from the parking lot of a Sunset Strip nightclub early on the morning of Sodel’s disappearance. Trude said that she and her friend, Elyse Browne, met a man named Tony Adams at a local night club. When he suggested that they drive to another, they agreed. Once they arrived at the second night spot, Adams excused himself from the table saying he would return in a few minutes. He never did. When Trude and her friend went out to get her car, it was gone. An all-points bulletin went out for Adams. A search of Adams’s home led by Sheriff’s Detective Captain Gordon Bowers turned up a photo which he showed to Jack Singleton. Singleton recognized the man as they guy he had helped with his car on September 17th. What didn’t turn up in the search was the .32 caliber revolver which acquaintances of Adams’s said he often flashed at bars and night spots. Five days after Sodel’s disappearance, a 35 man posse on horseback convened at dawn to conduct a search for the missing man. Under District Inspector Walter P. Greer of the Highway Patrol the posse was divided into three groups and set out to search the hills near Loyola University for Sodel but, once again, they failed to find him. On that same day three young boys—Robert Freyling, 9, Robert Irvine, 8, and his younger brother Blair Irvine, 5—were playing near a new subdivision in Baldwin Hills when they found Steve Sodel’s body. It was partly covered with dirt. His service revolver and handcuffs were missing but his identification papers and uniform were intact. The autopsy revealed that Sodel’s skull had been fractured—three .32 caliber slugs were lodged in his chest and two other bullets had passed through his body. At least now there was physical evidence to support the original theory of the crime—that Steve Sodel had been kidnapped and murdered. Steve Sodel’s brother officers assisted his widow with funeral arrangements. The rites were scheduled for 2 p.m., Wednesday, September 25, 1946 in Patriotic Hall, with interment in Forest Lawn Memorial Park, Glendale. Star Post No. 309, of which Sodel was Junior Past Commander, officiated. As Steve Sodel’s family grieved, law enforcement continued their search for Tony Adams. NEXT TIME: A killer is captured.